Cast iron and non O2 barrier piping. Should I replace the pumps now? I recently purchased a home with radiant floor heating. I don't know much about these systems except what I've been reading on these forums and online elsewhere. 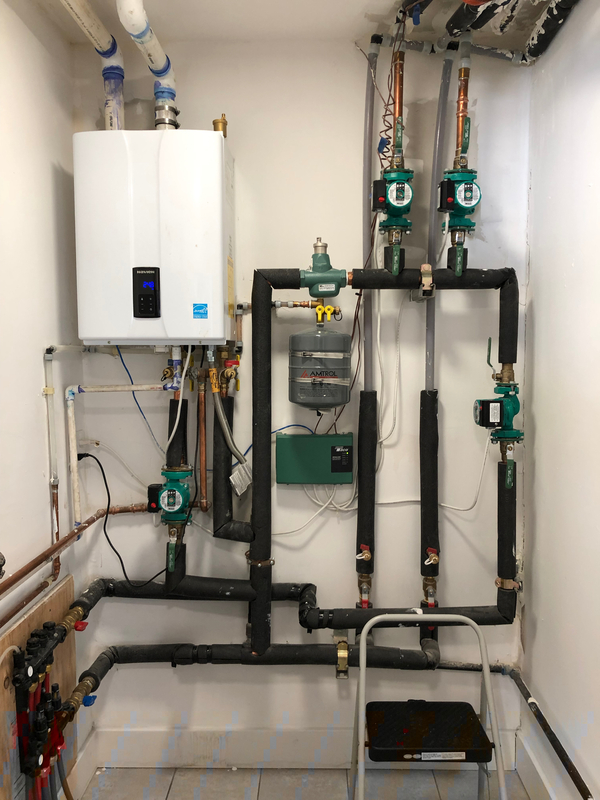 Summary of the system: Navien boiler, Taco multi zone control module, Wilo *cast iron* pumps, Taco *cast iron* Vortech Air Separator. I have 3 zones in the house, one for each floor. I can see the pex piping which are the loops for the bottom floor. These are the red pipes in the lower left corner of the photo. They are labeled Bluefin Rifeng and say they have an oxygen barrier. There are 2 gray pex supply pipes going to the 2nd and 3rd floors, and 2 gray pex return pipes from those floors. Those pipes are labeled Uponor AquaPex. From my research, it sounds like these do not have an oxygen barrier. So what is the right thing to do at this point? 1. Do nothing and wait for something to go wrong? 2. Replace the pumps and air separate with non cast iron versions? Anything ferrous will eventually meet its demise. If you wait no telling how long before failure. Murphy’s law dictates when you need it most. Not only that it’s the boiler that will get sludge also. I’d replace them, and add a combination dirt mag, and air separator. This will help collect anything already in the system. Or if accessible replace the aqua pex. yes it's really a shame. The house is brand new, less than two years old. I'm surprised and disappointed that the original installer screwed this up so badly. Unfortunately they don't seem willing to help me at this point (I bought the house after they did the install). Unfortunately the aqua pex isn't accessible. It's in the walls going between floors of the house. So looks like I'll swap out the pumps. Thanks for the tip on the combo dirt magnetic. I'll look into that.